• Nature’s Book Club – 9 am, “The Omnivore’s Dilemma” by Michael Pollan. Choosing among the countless foods nature offers, omnivores have to learn what is safe, and what isn't. Pollan’s work traces different food chains from ground to table, reveals the hidden components humans ingest, and explains how food tastes reflect their environmental and biological past. Weymouth Woods, 1024 Fort Bragg Rd., Southern Pines, 910-692-2167. Free and open to the public. • “Memory Monday” – 4 pm - 5 pm, “Creativity in Older Adulthood: Good for Memory, Good for Mood” part of the Hippocampus School for the Healthy Brain series. Topic will be presented by Taeh A. Ward, Ph.D., Clinical Neuropsychologist with Pinehurst Neuropsychology. 215-0900, Senior Enrichment Center, 8040 NC Highway 15-501, West End. • Eagle Springs Baptist Church – 5:30 pm, Children's Bible Study and Fellowship (ages 3-12), 6 pm, Middle School and High School Youth Group. • Weight Watchers Meeting – 5 pm to 6 pm, at St. Mary Magdalene Episcopal Church, 1145 Seven Lakes Drive, Seven Lakes. • Sunflix at the Sunrise – Eye in the Sky, 7:30 pm. Sunrise Theater, 250 NW Broad Street, Southern Pines (910) 692-3611. • Healing Service – 11 am, St. Mary Magdalene Episcopal Church. 1145 Seven Lakes Dr., Seven Lakes. Intercessory prayers for the sick & troubled, those in harms way, traveling, bereaved or deceased. Reverend Carol Burgess. All are welcome. • Seven Lakes Kiwanis Club – lunch at 11:30 am, meeting at 12:05 pm. Fellowship Hall of the Chapel in the Pines. Visitors are welcome. • West End Presbyterian Church – 2:30-4:30 pm, Tuesday Tutoring Crawford Center. • Seven Lakes West Landowners Association – 7 pm, meeting. West Side Park Community Center. Review agenda. • Our Lady of the Americas Church – 8:50 am, Rosary; 9:30 am Mass. 298 Farmers Market Rd, Biscoe 910-974-3051. • West End Presbyterian Church – 2:30 - 5 pm, WOW Program for K - 5th Grade. • AWANA for Kids – 6:30 to 8 pm. Children age 3 to 5th grade. Seven Lakes Baptist Church, 1015 Seven Lakes Drive. Seven Lakes, 910-673-4656. • Eagle Springs Baptist Church – 6:30 pm, Prayer Meeting and Bible Study. • Rosary at Chapel in the Pines – 7 pm, at the Chapel in the Pines. Coordinator Virginia Heerema, 673-5150. Seven Lakes. • Seven Lakes Landowners Association – 9 am, work session. Seven Lakes North Game Room. • Bread of Life Ministry – West End United Methodist Church, 11 am until 1 pm. Ministry is for seniors (widows, widowers, and the elderly). A time of fellowship and devotion and a meal provided at $5. • Foxfire Village Council Work Session – 6:30 pm, meeting, Foxfire Village Hall. • Save Our Sandhills – 7 pm, Southern Pines Civic Club, corner of Pennsylvania and Ashe. Working business meeting to bring folks up to date on current issues and seek comments and suggestions from those in attendance. Members should try to attend and the public is invited. Contact Ruth Stolting, 235-3862 or 638-7659. • Victory Baptist Church – Dinner – Ken Davis, Comedian (video) will be viewed. RSVP for reservations to attend: 919-499-7894, 915 Brinkley Road, Carthage. • Seven Lakes Baptist Church – 9 am Youth Golf Tournament, Foxfire County Club. • Eagle Springs Baptist Church – 10 am - noon, Food Pantry open. • West End Presbyterian Church – 8 am, Men’s Breakfast at the Crawford Center Kitchen; 10 am, Sunday School ages 3 - adult, Nursery available; 11 am, Worship, Nursery available. • Our Lady of the Americas Church – Rosary 8:15 am, 9 am Mass. Mexican food and drinks available after Mass. 298 Farmers Market Rd., Biscoe, 910-974-3051. • Chapel in the Pines – 9 am worship service, 581 Seven Lakes Drive. • St. Mary Magdalene Episcopal Church – 9:30 am, Holy Communion. 1145 Seven Lakes Drive. • West End United Methodist Church – Sunday School, 9:45 am, Worship Services, 8:30 am or 11:00 am. Everyone welcome, child care available. • Eagle Springs Baptist Church – 10 am, Sunday School; 11 am, Worship Service; Eagle Springs Baptist Church, 460 Eagle Springs Road. • Grace Church Seven Lakes – 10:15 am, Contemporary Worship and Service, Nursery and Children's Ministry provided, Seven Lakes Plaza. • Victory Baptist Church – 11 am, Christians Women's Day, includes “cardboard testimonies, ”various speakers and special music, 915 Brinkley Road, Carthage. • Museum of the Cape Fear – 1 pm - 5 pm. Guests can observe and participate in the maypole dance, create a floral crown or basket, and learn May Day songs and customs. Crown a Queen of the May. Cookies and lemonade served. Free Admission. For information about Museum of the Cape Fear, visit museumofthecapefear.ncdcr.gov or call (910) 486-1330. • Camouflage for Kids – 3 pm, Come out and explore how nature uses camouflage in so many ways. A short media presentation, an activity, and a short walk to look for some critters using camouflage. Weymouth Woods, 1024 Fort Bragg Rd., Southern Pines, 910-692-2167. Free and open to the public. • West End Presbyterian Church – 6 pm, Youth Supper and Meeting, Crawford Center Kitchen. • West End Presbyterian Church – 9:30 am, Morning Women's Circle, Crawford Center. • Moore County Board of Education - 4 pm, work session, Central Office, Carthage. • West End Presbyterian Church – 2:30 - 4:30 pm Tuesday Tutoring, Crawford Center. • Moore County Board of Commissioners – 5:30 pm, at the Historic Courthouse, Carthage. • Foxfire Village Council – 6:30 pm, Citizen Participation meeting to receive input from residents on the 2016-2017 Fiscal Year Budget. Foxfire Village Hall. • West End Presbyterian Church – 2:30 -5 pm, WOW Program for children K – Grade 5. • Run for the Roses Taste of the Town – 6 to 9 pm, 17th Annual Run for the Roses Taste of the Town benefit for the Sandhills Children’s Center at The Fair Barn, Pinehurst. Sample wines, craft beers, and hors d'ouevres from local chefs, along with live entertainment. Wear your best Kentucky Derby hat for a chance to win a prize. Cost is $60 per person. Call 910-692-3323 for tickets. Proceeds help children with special developmental needs receive therapies. • Senior Games “Fun Walk” – 9:30 am - 10:30 am, (for those who can’t compete at the Track & Field Senior Games Fun Walk event). Walk around the indoor track five times then wind down with some exercise with Esther Zolman. Enjoy Refreshments. 215-0900, Senior Enrichment Center, 8040 NC Highway 15-501, West End. • Women of Seven Lakes – 2 pm, Chapel in the Pines Fellowship Hall. Judy Lewis, Executive Director of the Prancing Horse Organization, will speak. Prancing Horse is a non-profit organization with a mission to enhance the lives of individuals with special needs by providing a safe environment for therapeutic riding. New Board for 2016-2017 will be installed. Refreshments served. For information about the Women of Seven Lakes, contact Lee Connelly, 673-2521. • Moore County Planning Board – 6 pm, at the Historic Courthouse, Carthage. • Pursuing Your Best Life – 11 am - 12 pm, Join Lynne Drinkwater and Esther Zolman as they present a topic of interest. 215-0900, Senior Enrichment Center, 8040 NC Highway 15-501, West End. • An Evening with a Monticello Garden Director – 7 pm, Peter Hatch, professional gardener and historian and former director of Thomas Jefferson’s Monticello Gardens and Grounds will speak at the Sandhills Community College Horticultural Gardens. His bood will be available after his presentation for purchase and signing. Program cost is $10 for Sandhills Horticultural Society members, $15 for non-members. Call (910) 695-3882 for a reservation. 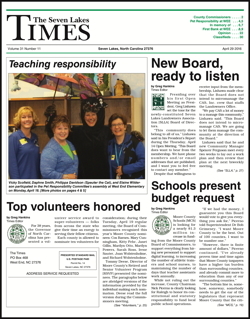 Send payment to Sandhills Horticultural Society, Att: Tricia Mabe, 3395 Airport Road, Pinehurst, NC 28374. Receipt of payment confirms your reservation. • West End United Methodist Church Men’s Breakfast – 8 am, in the church Fellowship Hall. Enjoy a home-cooked breakfast and time of fellowship. A brief devotional, men discuss projects to assist both the church and the community. Any man of the church or our community is welcome to attend. • Cameron Annual Spring Antiques Street Fair – 9 am to 5 pm, held rain or shine. Spring tradition for over 25 years, Food, refreshments, and parking by local churches and civic groups, antiquesofcameron.com 910 245 1231 and 910 245 3020. • 5th Annual Outdoor Singing & Church Yard Sale – 10 am - 5 pm, lots of yards sales items and vendors set up. At Bible Pentecostal Holiness Church, 311 Browns Chapel Road, Robbins. • West End Presbyterian Church – 10 am, Sunday School Ages 3 - adult Nursery available; 11 am Worship service. Mothers’ Day, WOW Choir sings. Nursery available. • Mother’s Day Hike – 3 pm, Get back to nature on Mother’s Day Sunday and discover helpful forest plants that mothers have used through the centuries to improve family life. Join a Park Ranger for a brief presentation in the auditorium that will be followed by a short hike. Weymouth Woods, 1024 Fort Bragg Rd., Southern Pines, 910-692-2167. Free and open to the public. • Moore County Board of Education – 6 pm, regular meeting, Central Office, Carthage.